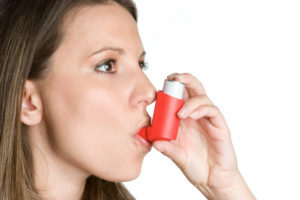 Allergic asthma is the most common form of asthma, accounting for about 80% of all asthma cases. The symptoms of allergic and non-allergic asthma are generally the same – and typically include coughing, wheezing, shortness of breath, rapid breathing, and tightness in the chest. A dust mite allergy is often confused with a common cold. Symptoms can include a runny or stuffy nose, watery and itchy eyes, and bouts of sneezing or coughing. Allergic skin reactions such as rashes and agonizing itching are also common, because dust mites are a major trigger for eczema flare-ups. If the symptoms of a dust mite allergy are not taken seriously and are not treated in time, the allergic reaction can spread from the upper to the lower airways and eventually lead to allergic asthma. Once acquired, allergic asthma can require life-long treatment with medication, and can significantly affect your daily activities. Avoiding contact with dust mite allergens is the key! Medical studies have proven: Allergen avoidance is the first and most important step to prevent allergy symptoms. (3) Dust mite allergy sufferers need to avoid contact with the allergy triggers: The proteins in mite droppings, eggs, and remains of dead mites. Your primary aim should be reducing house dust mites, especially in your bed, because this is where the allergen accumulation is particularly high. Replacing old mattresses, and washing all other parts of your bedding with hot water at least every 2 weeks are commonly recommended steps for dust mite allergy sufferers. However, it is not possible to completely get rid of dust mites and the mite population will quickly build up again, no matter how clean your house is. Without the use of encasings, a new mattress will be full of dust mites again after only 6 months. An effective and proven step to avoid contact with dust mite allergens, is to dust mite proof your bed with high quality encasings. To ensure complete protection against dust-mite allergens, you should cover your mattress, duvet, and pillows with Allergo® encasings. Allergo® encasings are made of high-tech microfiber fabrics that top the best-in-class products on the market in allergen retention and breathability. Our Allergo® Majestic fabric is extra tightly woven and compressed under high temperatures (calendered) and has an average pore size of less than 0.3µm – ten times smaller than comparable products on the market! Allergo® encasings are completely impermeable for dust mites and even the tiniest allergen particles. At the same time, Allergo® encasings are highly breathable, allowing free passage of air and water vapor, and creating a pleasant and healthy sleeping climate. With these unique features, Allergo® encasings are a highly effective barrier against dust mite allergens. If you cover your mattress, pillows and duvets – including your partner's – with Allergo® encasing, you are completely safe from dust mite allergens, 100% guaranteed. The encasings also effectively stop the dust mite population from growing. The enclosed dust mites have no more access to food, they can no longer multiply, and eventually die. Covering your mattress and all of your bedding with genuine Allergo® encasings is a simple and highly effective step to achieve maximum protection from dust mite allergens. You will alleviate your allergy symptoms, and ensure a good night's sleep. Protecting yourself from inhaling dust mite allergens will also reduce your risk of developing allergic asthma in the long run. Reducing domestic exposure to dust mite allergen reduces bronchial hyperreactivity in sensitive children with asthma; Ehnert B et al; J Allergy Clin Immunol. 1992 Jul; 90(1):135-8. Allergen avoidance is associated with fall in exhaled nitric oxid in asthmatic children; Piacentini GL et al; J Allergy Clin Immunol. 1999 Dec; 104(6): 1323-4. Indoor allergens and asthma: Report of the Third International Workshop; Platts-Mills, TA et al; J Allergy Clin Immunol. 1999 Jan; 100(6 Pt 1):2-24. Methods and effectiveness of environmental control; Tovey E; Marks G; J Allergy Clin Immunol. 1999 Feb; 103(2 Pt 1):179-91.